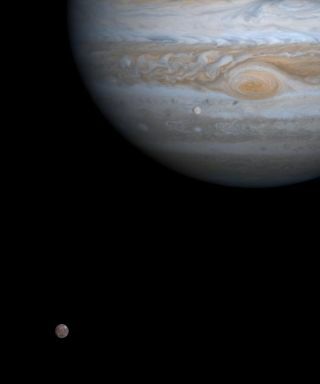 NASA's Cassini spacecraft captured this image on Dec. 7, 2000, just as two of Jupiter's four major moons, Europa and Callisto, were nearly perfectly aligned with each other and the center of the planet. If extraterrestrial life exists on Jupiter's moon Europa, instead of deployingprobes to drill past its ice shell to look for aliens in the ocean below, onemight just go fossil-hunting on the icy surface. "Aprospector sent there could possibly find extraterrestrial life within ourlifetimes," suggested planetary scientist Richard Greenberg at theUniversity of Arizona's Lunar and Planetary Laboratory at Tucson. Europa,which is roughly the size of Earth's moon, is enveloped by a global ocean thatmay be about 100 miles deep (160 km). This ocean is overlain by an icycrust of unknown thickness, although some estimates are that it could be only a few miles thick. Sincewherever there is water on Earth there is a chance of life, for many yearsscientists have entertained the notion that this Jovian moon could supportextraterrestrials. Recentfindings even suggest its ocean could be loadedwith oxygen, enough to support millions of tons worth of marine life like the typethat exists on Earth. To see if any kind oflife actually evolved on Europa, scientists have proposed missions to drill through itsouter shell,perhaps usingheat to melt through the ice, whirring blades to clear away rocks and robotsubsto explorethe ocean. "Withthat vision in mind, NASA has a multi-staged plan, first with a Europa orbiterscheduled for 18 years from now, and 10 or 20 years after that, a lander to seewhat the surface is like, and then maybe a generation later, hopefully we canfigure out how to drill all the way down through the ice," Greenbergnoted. He recently wrote a book, "Unmasking Europa," which touchedupon how one might search for life on the Jovian moon. However, rather thandeploying complex equipment to try and penetrate an uncertain distance into theice, the remains of marine life on Europa could be available right on the outershell for landers to find. Scientists aren'tsuggesting that any life from Europa somehow managed to dig its way up throughthe ice. Instead, the constant upheaval this Jovian moon undergoes could dragunwitting organisms upward, Greenberg explained. Thescarcity of craters seen on Europa suggests the ice shell is no older than 50million years old, hinting that it underwent complete turnover in that time.The culprit for this extraordinary activity is the gravitational pull Europaexperiences from Jupiter. This leads to tidal forces roughly 1,000 timesstronger than what Earth feels from our moon, flexing and heating the Jovianmoon and constantly stirring its crust. Ice — probably newly frozen ocean water — apparently regularly gets pushed up frombelow, leading double ridges typically 330 feet high (100 meters) to form andcover at least half of Europa's surface. Parts of the surface also couldpartially melt from below, creating rafts of ice that break loose and tumble around. Thisprocess creates the "chaotic terrain" that comprises roughly 40percent of the ice shell, and also sends matter both upward and downward. "If there are organisms in Europa's ocean, one could wellimagine that all over the surface there might be frozen chunks of thatstuff," Greenberg said. "People are talking about various kinds ofdrills and melting down through the ice, and I think we can jump past that andsample the ocean from the surface." Oneof the best places to look for any fossilson Europa would be newly formed double ridges, Greenberg said. "Theridges that crisscross others are going to be the most recent ones," heexplained. "One could then imagine landers scooping up the ice andanalyzing it." Chaoticterrain would also be another good area to explore, as would an active crack inEuropa's crust. "Ifwe can land right next to an active crack, there's a good chance we could samplesome of the most recent ice," Greenberg said. "If we could put apenetrator into it, we could even sample water as it comes up." If any microbes didmanage to make their way to Europa's surface, the constant stream of radiationfrom Jupiter would likely break their proteins down over time, assuming such life would have proteins at all, said planetary geologist Brad Dalton at NASA's Jet PropulsionLaboratory. Still,experiments of Dalton's have suggested orbiters could investigate the infraredsignature of Europa's icy crust to look for tattered remnantsof life. Landerscould conduct even more detailed analyses — for instance, using"lab-on-a-chip" devices on melted ice samples to look forbiomolecules, he added. Also "there's always the possibilitythat we could find structures — something analogous to skeletal remains,"Greenberg noted. Dalton added that if landers dug "even a meter or sodown might also be able to find viable organisms, if there are any there." Ofcourse, if there is life in Europa's ocean, it remains uncertain whether itwould indeed get lofted up via geological processes to its surface. Conversely,if no life is seen on Europa's surface, that does not mean there is no life inEuropa's ocean. "Mypoint is only why wait to look for life at the hardest place on Europa to getto?" Greenberg said. "Why not go to the easy place first?"